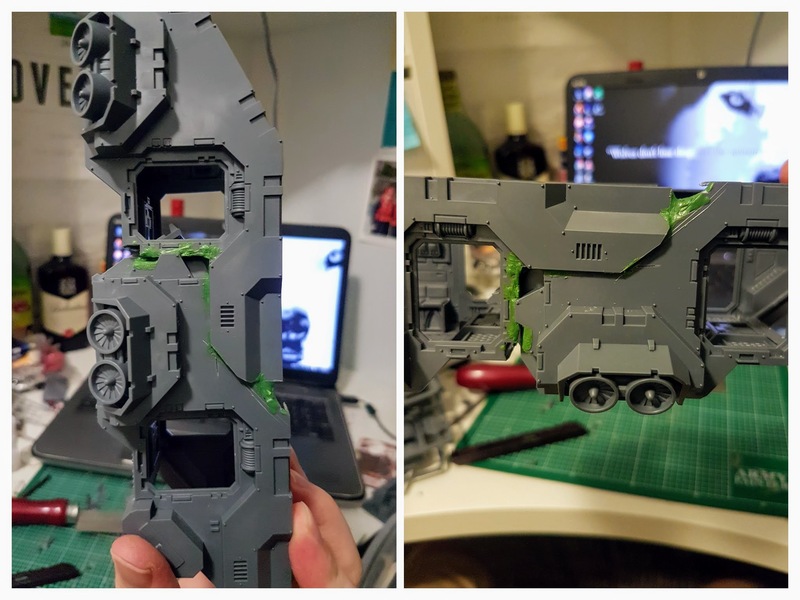 Part I of my Custom Thunderhawk Gunship project finished with the basis of the hull being completed. And what looked like the capability to lift itself off the ground, which was an important alteration in my custom build over the Forgeworld version. But while i’m happy with some parts of the new hull, other parts not so much. Due to the heavy cutting and alterations on the two separate Stormraven Gunship frames, the joins are very flimsy and easily slipped apart. I was worried that this might allow for too much bending in the final model. But alas, the butchering had already been done, so I decided to rely heavily on Green Stuff for the structural integrity I wanted. You can see this in the image below where I’ve began to fill in the missing framework. In the above image you can also see the rear assault ramp now being used to cover the large flooring gap. With the extended hull and 4 side access points, this custom Thunderhawk Gunship is starting to take a more recognisable shape. 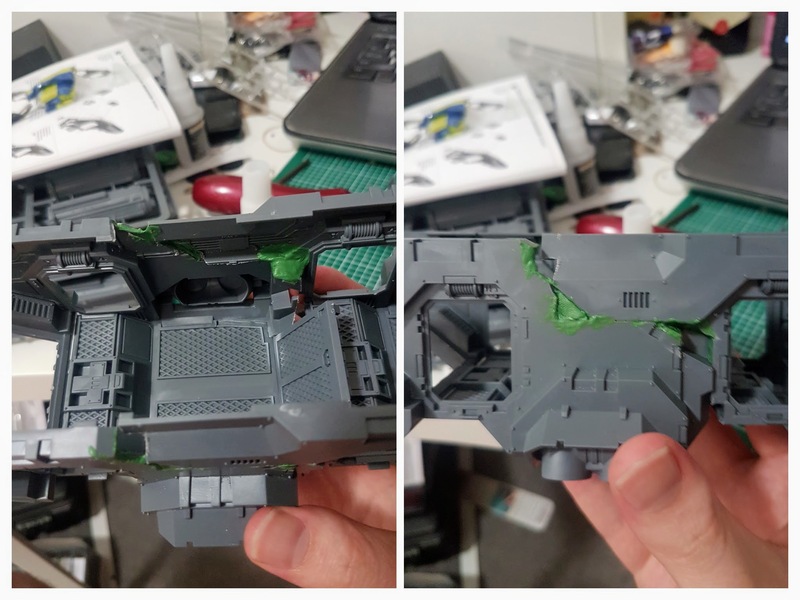 But given the extensive green stuffing and plasticard work i’ll inevitably have to do to the sides and underside of the hull, I’ve decided to not worry about displaying the internals of the ship. The roof will be fixed into place, which will help cement the whole model together more both aesthetically and structurally. All of the green stuffing work so far has been quite rough. With such large gaps and odd angles to fill, I’ve been more focused on getting the pieces connected. Ideally it will all be smoothed over with a bit of sanding and file work much closer to the end of the project, before all of the detail gets added in. There’s still a lot more holes to plug int his boat before she’s ready to fly, but i’m happy with the progression overall. Already the hull feels more like an impressive gunship, and i’m quite happy with how the initial concept is turning out. The only real thing I would have changed so far is to have been more precise with the cutting so the frame would have been more even. But half the fun in these builds is overcoming mistakes or design changes, so I won’t complain too much. In the final image below, you can see the progression of my custom Thunderhawk Gunship. It’s sitting up on a Games Workshop flying stand without any additional weights, so i’m pretty happy with the balance! I’ve also dry fitted the roof which is just the two top compartments of the Stormraven Gunships. The forward one has only minor alterations to the end to get it to fit in line, and the rear one has the whole front angled section removed. They look more uneven here than normal because the framework isn’t finished being bulked out and so the roof dips in slightly. That will get filled up later. You can also see my early attempts at working on the main gun. Here I’ve used some bits from the Baneblade kit which was kindly donated. 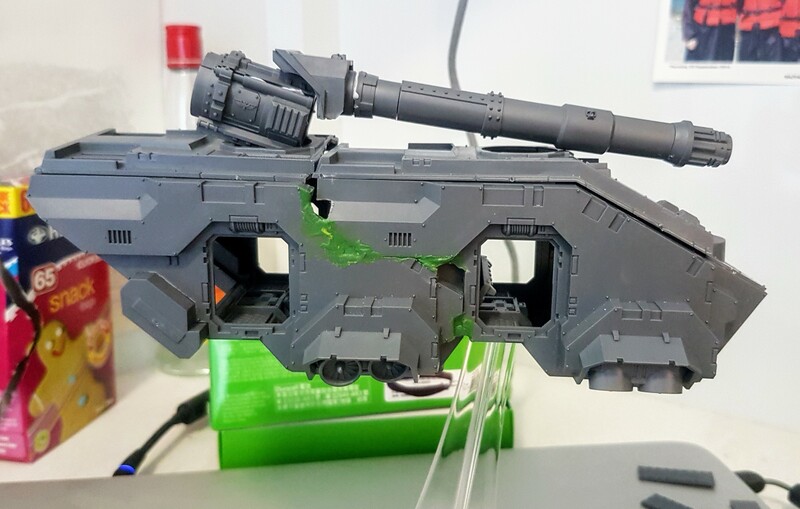 It’s attached to a demolisher cannon and housing from a Space Marine Vindicator tank. It’s still a work in progress and is currently being held together with Blu-Tack. I’m happy with the length of the weapon, as it’s meant to be imposing I want it to stand out. However, I’m not set on how it will be affixed to the hull. Either with an additional level, turret, or some other method. That’s all still to be decided. Since the Thunderhawk Gunship is meant to be a flying land raider, my hull is still lacking some bulk. The landing gear, doors, side sponsons, wings, and rear thrusters still need to be added. And these will help fill out the model more. And help the custom Thunderhawk Gunship begin to take a more iconic shape. With each update, it’s starting to look the part of a fearsome troop carrying gunship that it’s meant to be. Stay tuned for Part III, and Part IV. If you have any questions or suggestions about the build, let me know in the comments below.